There is a burglary somewhere in the United States every 15 seconds. Over half of all commercial burglaries occur after dark. Over one third of inventory loss occurs as a result of shoplifting. Experts believe that businesses lose more to employee theft than to burglary, robbery and shoplifting combined. How do I decide how much protection is right for my business? A First Alert Professional Authorized Dealer can evaluate and recommend security solutions for your company’s unique needs. You may consider Opening and Closing reports as a way for you to keep track of events occurring at your business. Opening and Closing reporting is a tracking system that gives business owners and managers critical information that assists in watching day to day operations. Depending on the option you select, opening/closing reports can be supplied to you monthly or weekly. Contact a First Alert Professional Authorized Dealer near you for a free consultation or call us toll free at 1-800-244-1433 for immediate assistance. Why Choose a First Alert Professional Security System? First Alert Professional, a Honeywell company, is your dedicated partner in providing today’s finest business security alarm systems to fit your needs and budget. Our security products and services are only available to you by our First Alert Professional Authorized Dealer Network, who value and care about your safety as much as you do. First Alert Professional dealers help build safer communities by supporting our Life Safety program as well as protecting millions of businesses around the globe using our professional security products. Call 1- 800-244-1433 or contact a First Alert Professional Authorized Dealer for a free security evaluation. Whether you’re a corporate CEO, a small business owner or the head of a household, security is your business. That’s why Sonitec offers so many business security solutions to meet the widest range of needs. 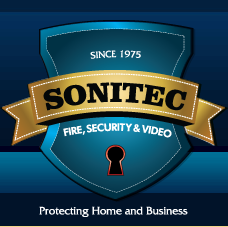 With Sonitec you can protect your office facilities, employees and assets. Deter potential shoplifters at your store with our First Alert Professional burglar security alarm systems. Secure access to clinical records. And deter property damage. And lots more. So no matter what line of business you’re in, Sonitec First Alert Systems are the smart choice for security.